Metrolinx-GO transit are installing a girder at the Lansdowne Avenue bridge. Beginning on Saturday, May 2 at 6 a.m. until Monday, May 4 at 6 a.m., Lansdowne Ave. will be closed to vehicle traffic between Seaforth Ave. and Shirley St. to allow for equipment delivery, utility relocation and installation of the bridge girder. • Beginning on Saturday, May 2, at 6 a.m. until Monday, May 4, at 6 a.m. Lansdowne Ave. will be closed to vehicle traffic between Seaforth Ave. and Shirley St. to allow for equipment delivery, utility relocation and installation of the bridge girder. • The west sidewalk may be closed for crane set up. The east sidewalk will remain open; however, pedestrians may experience short delays when the bridge girder is lifted into place. • Detour signs will be posted in advance of the work. • Access to the No Frills store on Lansdowne Ave. will remain open at all times. • The TTC bus route 47 will detour around the work area. Please visit ttc.ca for more information on the detour route. 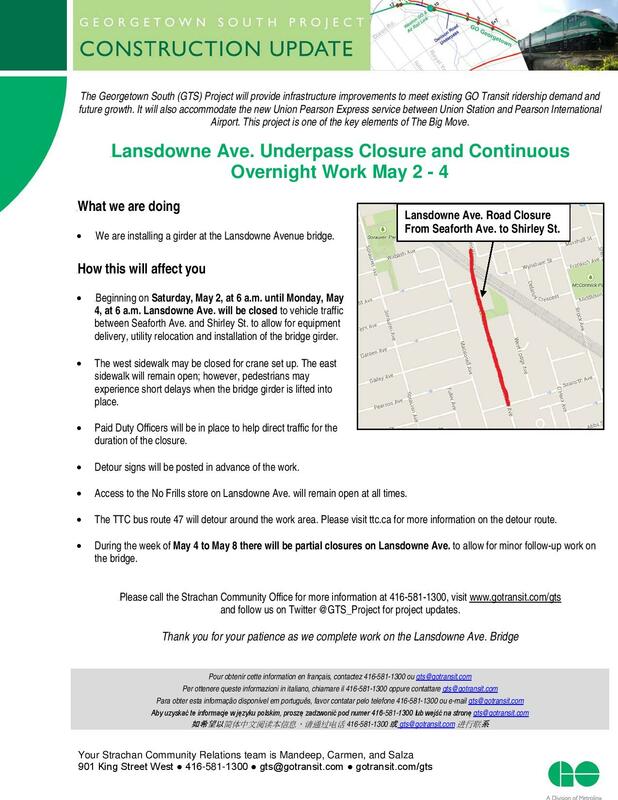 • During the week of May 4 to May 8 there will be partial closures on Lansdowne Ave. to allow for minor follow-up work on the bridge. City of Toronto seeking 16 public members for the Property Standards Committee. The current deadline for members of the public to apply for the Committee is Friday May 1st at 4:30 p.m. Residents can apply by visiting:https://secure.toronto.ca/pa/decisionBody/72.do. 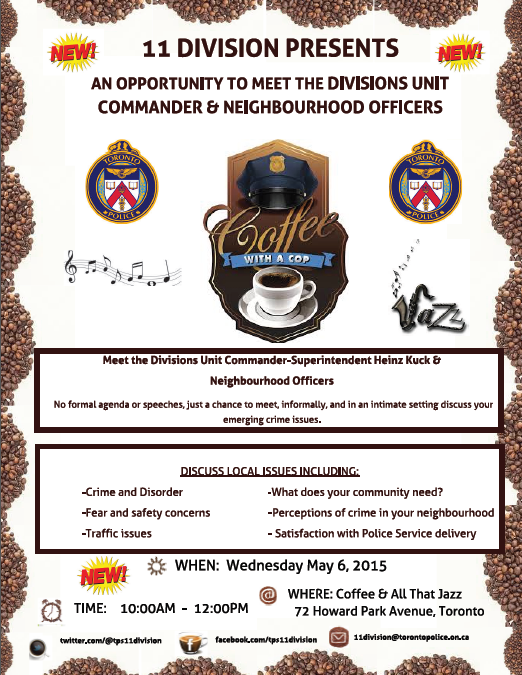 This year’s Spring Into Parkdale event will take place on Saturday May 9th between 11:00AM – 6:00PM. Metrolinx – GO Transit will be completing some overnight track work from April 26 to May 1 between 7 p.m. and 5 a.m. 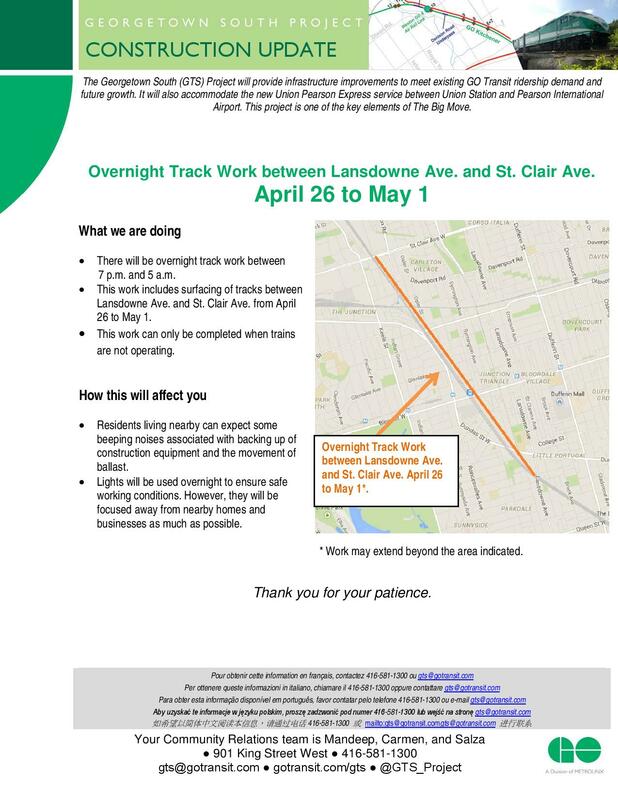 This work includes surfacing of tracks between Lansdowne Ave. and St. Clair Ave.
7 p.m. and 5 a.m.
• This work includes surfacing of tracks between Lansdowne Ave. and St. Clair Ave. from April 26 to May 1. • This work can only be completed when trains are not operating. • Residents living nearby can expect some beeping noises associated with backing up of construction equipment and the movement of ballast. • Lights will be used overnight to ensure safe working conditions. However, they will be focused away from nearby homes and businesses as much as possible. Great news! The installation of solar photovoltaic at the King Yard – 1116 King St W has begun and should be completed this summer. 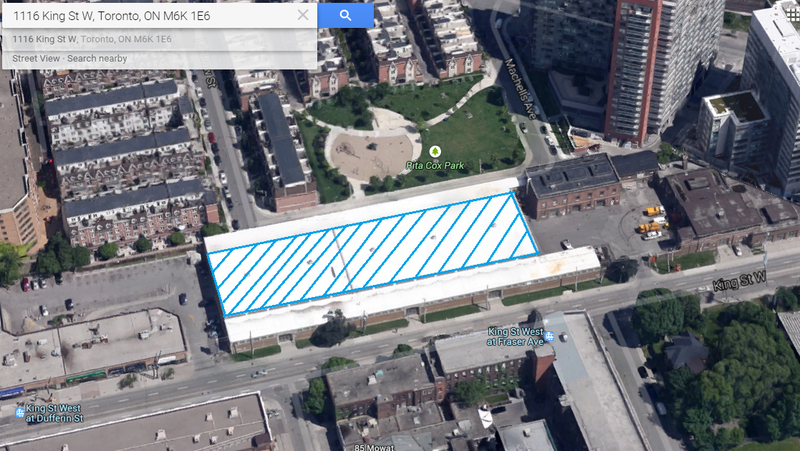 The installation at King Yard is part of a joint City/Toronto Hydro Solar PV program. The Toronto Renewable Energy Office (TREO), in the Environment & Energy Division, is the City’s lead on the program. The solar PV system will consist of 677 solar panels tilted at 10 degrees facing south. Total size is 210 kilowatts (kW). The system will be connected to the Toronto Hydro electrical grid. The City will receive revenue for 20 years from the sale of electricity generated by the system, through Ontario’s Feed-in Tariff program. The city of Toronto is home to over 10 million trees of various shapes, species, and sizes. Many have led fascinating lives and hold special places in our hearts. While the trees can’t share their stories, you can! That’s why LEAF, in partnership with TD Friends of the Environment Foundation, along with Ontario Power Generation and the City of Toronto, is hosting The Great Toronto Tree Hunt – a contest to find and celebrate the greatest trees in our city. Online nominations will be accepted April 22 – May 31, 2015. Public voting runs June 1 – 15, 2015. It’s easy! To nominate a tree, just take a quick snapshot or an artistic photo and provide a brief description of why that tree is great. You or your group can nominate as many trees as you’d like online in each of the five categories. One winner in each category will be selected through a combination of votes and judging. A cash prize of $250 will be awarded to each winner! Nominations will be posted online and finalists in each category will be published on our website on June 23, 2015. Winners and prizes will be announced at an awards ceremony held June 24, 2015. Click here for a full list of rules and judging criteria. On Torontoist​ today, I discuss what beer in grocery stores will really mean for municipalities and you.